Home » Media Room » News » 5th win at SAFA Awards! 5th win at SAFA Awards! Akshaya Patra has won the SAFA Best Presented Annual Report Awards 2013 in the Non-Governmental Organizations (including NPOs) category! In this highly illustrious contest evaluated by SAFA (South Asian Federation of Accountants), Akshaya Patra has come first, ahead of all the SAARC countries participating. This exemplifies the excellent standards that the Foundation continues to maintain in its financial accounting. The award was conferred to Akshaya Patra on 4th December in Bhubaneshwar, and was accepted by Achytya Krishna, on behalf of the organisation. The Annual Report was evaluated based on certain stringent criteria like Improvement in Transparency, Accountability and Governance shown in the entries submitted by the South Asian countries. 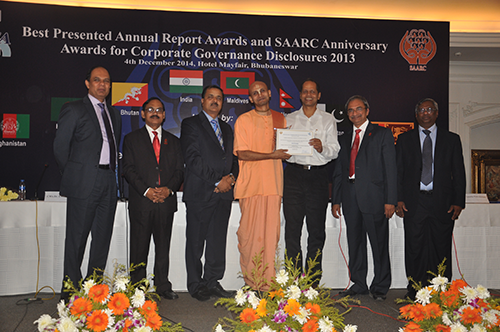 Expressing his pleasure over receiving the award Chanchalapathi Dasa, Vice-Chairman of Akshaya Patra said, "We are honoured to have received this prestigious award, SAFA Best Presented Annual Report Awards 2013. This is indeed a testimony to our adherence to the highest standards of governance philosophy and our continuous strive for excellence by adopting the best practices. The award encourages us to keep performing efficiently and ethically". SAFA is a platform for professional accountancy agencies to work towards the continued progression and distinction of the accountancy profession in the SAARC region. This is the fifth time that Akshaya Patra is receiving a SAFA Award.